According to numerous researchers, the ancient Vinca (Vinča) culture depicted extraterrestrial visitors, gods that came from the sky and provided the necessary push for the advancement of civilization and technology among humans. There has been a lot of speculation about the existence of extraterrestrial beings and the possibility of them interacting in the distant past, with ancient civilizations on Earth. Evidence of such encounters can be found across the world. In every single continent there appears to be evidence recorded in texts, monuments, and artifacts pointing toward the existence and interaction of extraterrestrial beings. In many ancient depictions we see beings with oval-shaped heads, giant almond-shaped eyes that have specific dark pupils, narrow noses with slightly marked small mouths that most of the mites have no lips. The head is composed out of the specific shape that is in most cases, larger than the rest of the bodies. The color of the creatures ranges from blueish gray colors to light brown. The depictions of these creatures has been attributed, from the standpoint of rationalistic and materialistic science, to hallucinations due to the ingestion of drugs or alcohol, fantastic projections of the collective unconscious, and hallucinations that are a result of certain brain injuries or diseases. Strangely, these depictions have existed in the distant past, about 7000 years BC in some European countries including the Balkans, former Yugoslavia and Northern Greece. Map showing the extent of the Vinča culture within Southeastern Europe. There is a great amount of evidence and many archaeological findings that have been proven to be authentic. The sequence of the Vinca (Vinča) culture is a set of very well documented items in the Vinca region, in the vicinity of Belgrade – 14 km of Belgrade, Serbia. Excavation in the area have yielded over 2000 of these mysterious looking figurines, the largest number of items of that type discovered in the region. Putting the puzzle together, this has allowed archaeologists to verify that several centuries ago, human groups that inhabited the region received almost spontaneously a significative impulse that helped them become a civilized society, enabling them to develop a syllabic-alphabetic language and or linear writing system judging by the amount of phonetic signs used in it. All of this occurred several thousand years before the rise of the great ancient civilizations of the Euphrates and the Nile. This according to most researchers is considered as an archaeological anomaly. Numerous archaeologists who have studied this enigmatic civilization do not have a convincing explanation for this anachronistic culture that was obviously too evolved for a time when most of the cultures of the Old World were still in the Neolithic stage, a time when not a single megalithic monument was erected. What is perhaps most disconcerting is the fact that along with numerous samples of ceramic-naturalistic paintings and objects, engraved with amazing inscriptions, there are over three thousand ceramic and stone figurines where besides human and animal representations, are mainstream representations of strange humanoid beings whose characteristics fit perfectly into modern-day descriptions of otherworldly beings such as the grey aliens, believed to have visited Earth in the distant past, and even today. The Vinca (Vinča) culture figurines are original and unique items yet resemble art of other cultures in Mesopotamia and the Americas. The question many have asked is, why? 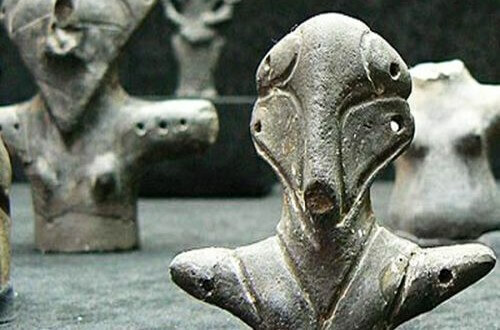 The mysterious depictions of the Vinca Culture – Extraterrestrial beings? Even though the Vinca culture has had contact with other neighboring cultures, the sculptural art of the Vinca (Vinča) remained markedly different from that of other cultures in the region. The most distinctive feature of these mysterious figurines are triangular shaped faces, large almond shaped eyes, mouths and noses that are nonexistent in most cases, which strangely seem to resemble animals such as grasshoppers. Some of these figurines mysteriously depict a combination of hybrid beings, half-human half reptile. Most of these strange humanoid figures are depicted as guardian deities, some of them are believed to have been good while some of them evil. The zoomorphic-anthropomorphic depictions are a mystery that many researchers have not found an answer to. According to researchers, the most striking sculptures representing the latest development of Vinca art are the monumental heads with a relatively normal size, that have some sort of helmet or mask. The widening of the mask follows the oblique line of the eyes, and its projection goes all the way to the height of what appear to be ears. What was the artists goal upon creating these masks and figurines? Did the artist intend to depict the Gods and deities which brought numerous advancements to their society and other human beings? The objective here is to go beyond mere classification or identification of objects according to the criteria and principles of methodology of mainstream archaeological research. What caused the ancient Vinca do depict such mysterious creatures? What inspired them to create such sticking figurines, clearly not of human nature? Everything man does is, in one way or another, an imitation of the real world and nature around him. This points to the fact that the depictions of the ancient Vinča culture, are actually what they had seen thousands of years ago. Is the Vinca culture evidence of prehistorical contact with extraterrestrial beings, around 9000 years ago? Researchers believe that the origin of the strange iconography is not only based on the physical appearance but also on other aspects such as the appearance of advanced linear syllabic-alphabetic writing and language, a form that would reappear several thousands of years later in other advanced civilizations of the mediterranean. Interestingly, in civilizations of Southeast Europe there are no previous phases in the evolution of the writing system. Writing came to be “suddenly” in a relatively evolved form. It is a destabilizing fact breaking all previously established patterns, breaking the foundations of structures established by scholars of one of the most important marks of ancient civilizations, the writing system. It may not be coincidental that this cultural and so to speak technological leap appears associated with the first depiction of otherworldly creatures that could have been considered as gods thousands of years ago. Researchers believe we are facing one of the oldest proofs of human contact with extraterrestrial beings that came from other planets or other dimensions. We are faced with depictions of human-like beings obviously not connected or similar to any of the races or species of known hominids. This has led to the conclusion that these depictions are anything but human from a anthropogenic point of view. Ancient oriental texts and doctrines speak of highly advanced beings which participated in the formation of civilization as we know it today. Depictions and texts about these beings are found in cultures across the globe, in every single corner of the world, yet for some reason, we seem to look past these depictions.